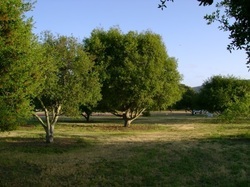 ​Earth Day of 1991 marks Lionel’s first major tree planting–in collaboration with Cuesta College, 58 oaks of several varieties were planted at the entrance of the college. Students provided the labor, and grounds keepers have maintained the trees over the years. Auspiciously, all of the trees have survived, some reaching heights of 20 ft. in less than that many years. The planting project has set a precedent for OneCoolEarth’s activities in the area, modeling our goals of sustainability in its minimal requirements for upkeep, beauty, practicallity in offering shade and habitat, and its overall effect of drawing attention to native landscaping. The original planting and its success have led to further collaborations between OCE and Cuesta: involvement of the Grassroots Gathering environmental club in later planting projects, a restoration of part of Pennington Creek with assistant from the Fish and Game Department, plantings at the Fairbanks Cross Country track, and the latest project, a grant proposal with the Morro Bay Estuary Program to restore, landscape, and install a nature path with interpretive signs along a stretch of Pennington Creek.